Please select a size. EU 37 - Low StockEU 38 - In StockEU 39 - In StockEU 40 - Low Stock Please select a size. Turning heads left right and centre, the stunning Pulse heel arrives from Public Desire. 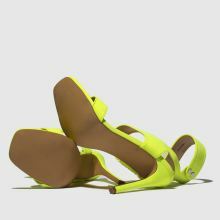 Boasting a square toe and chic ankle straps with studded detailing, this neon yellow man-made profile is all you need this party season. A 10cm heel completes.